14.6.1. Totally, the flag is folded in two parts reminding us of 2 parts of life; our birth and death and our life here and hereafter. The red and white stripes interchange throughout our flag reminding us; in the red, of the blood and hardships of life and in the white, of the purity and goodness of life. Every life has both red and white. The flag is carefully folded into the shape of the tri-cornered hat, reminiscent of the hats worn by the soldiers who fought and won the revolution for American independence. The three fold also reminds Christians of the 3-in-1 of the Trinity: Father, Son, and Holy Spirit. The red and white are soon folded and only blue and the stars are seen, reminding us of heaven. When our life of red and white is over, may only heaven remain? Folding the flag is done to honor the end of something; the end of the duty day at Retreat, the career of a service member or the life of a veteran during his or her funeral. It has also been performed at events celebrating national holidays such as Veteran’s Day and Memorial Day, and for solemn events such as to honor those that perished September 11, 2001. 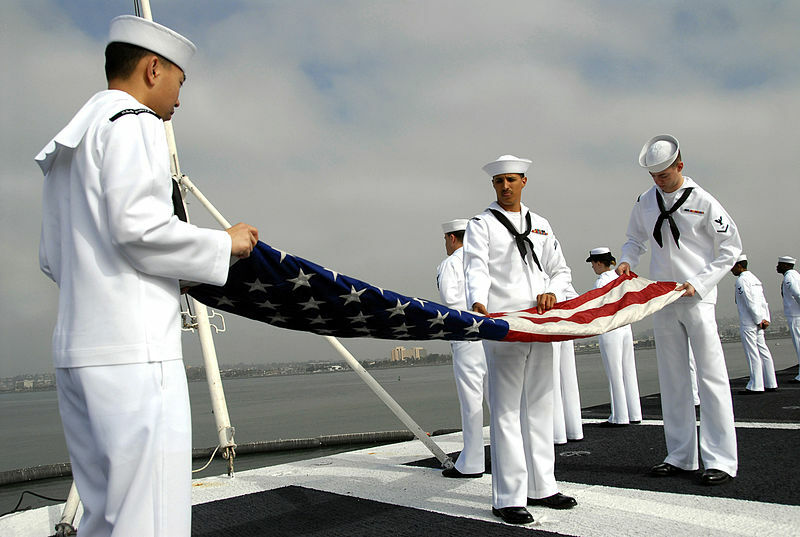 The U.S. flag is folded any time it is not flown, displayed, or draped upon the casket of a veteran. • As part of a military member’s retirement, the ceremony must be specifically introduced as being performed at the request of the retiree. • That any Air Force members participating in the Flagfold Ceremony must have volunteered to do so. • No military office, such as the base Protocol office or the Honor Guard, may distribute or recommend any script that assigns specific meaning to the folds of the United States Flag. The Flag-fold ceremony can also be performed as a “silent fold”, with no script read aloud. Retirement ceremony As part of their retirement ceremony, the retiree ay choose to have the folded flag presented to their spouse, parents, other family members or donate it to an organization. Frivolous events The Flag-fold ceremony should not be performed for frivolous events, “just to have it” such as a meeting that has nothing to do with national pride, service, or sacrifice. The folding of our flag should not to be denigrated by trivial use. If you have been assigned as a point of contact to arrange a retirement ceremony, or have an event scheduled and are considering a performance of the ceremony, contact Tech. Sgt. Marty Haynes at 572-2077 for more information. Air Force Print News WASHINGTON — Air Force leaders recently approved a new script that can be read during flag-folding ceremonies. Though there are no official ceremonies in the Air Force that require a script to be read when a flag is folded, unofficial ceremonies such as retirements often do, said Lt. Col. Samuel Hudspath, Air Force protocol chief. “There is no shortage of scripts available that can be read aloud during a flag folding, but many of those scripts are religious in nature and also ascribe meaning to the individual folds put into the flag. One of the oldest of those scripts is attributed to an anonymous chaplain at the U.S. Air Force Academy. Individuals who hear those scripts end up attributing the contents of the script to the U.S. Air Force. But the reality is that neither Congress, nor federal laws related to the flag, assign any special meaning to the individual folds. Colonel Hudspath said that was the primary motive for creating a new flag-folding script. “Our intent was to move away from giving meaning, or appearing to give meaning, to the folds of the flag and to just speak to the importance of the flag in U.S. Air Force history,” he said. The new script, approved in July, focuses on flag history and the significance of the flag within the Air Force: “Today, our flag flies on constellations of Air Force satellites that circle our globe, and on the fin flash of our aircraft in harms way in every corner of the world. Indeed, it flies in the heart of every Airman who serves our great nation. The sun never sets on our Air Force, nor on the flag we so proudly cherish,” the new script reads. The new script is available at base protocol offices for use by anybody who wants to lend significance to a flag folding, Colonel Hudspath said. The script will not be used at retreats or funerals, as those are silent ceremonies. By October, officials said the Air Force will make a video available to protocol offices and honor guard units that demonstrates a flagfolding ceremony using the new script. This entry was posted on Saturday, July 29th, 2006 at 2:54 am and is filed under Accuracy, Bad Quotes, Flag etiquette, History, Patriotism. You can follow any responses to this entry through the RSS 2.0 feed. You can leave a response, or trackback from your own site. Air Force leaders recently approved a new script that can be read during flag-folding ceremonies. There is no shortage of scripts available that can be read aloud during a flag folding, but many of those scripts are religious in nature and also ascribe meaning to the individual folds put into the flag. One of the oldest of those scripts is attributed to an anonymous chaplain at the U.S. Air Force Academy. Individuals who hear those scripts end up attributing the contents of the script to the U.S. Air Force. But the reality is that neither Congress, nor federal laws related to the flag, assign any special meaning to the individual folds. Hudspath said that was the primary motive for creating a new flag-folding script. The new script is available at base protocol offices for use by anybody who wants to lend significance to a flag folding, Hudspath said. The script will not be used at retreats or funerals, as those are silent ceremonies. By October, officials said the Air Force will make a video available to protocol offices and honor guard units that demonstrates a flag-folding ceremony using the new script. I’m with Todd Lopez, as to what he says in his April 12, 2007 comments. I am also the author of the article cited from the Holloman AFB “Sunburst”, May 27, 2005. Just as Todd mentions in his comments, there are no really “official” ceremonies in the Air Force, therefore I did not “reach” to avoid any endorsement of any flag-fold script. I was briefed on the “requirements” of the new ceremony and script and while I was on active duty and the NCO in Charge of the Base Honor Guard at that time, I was obligated to support it. My understanding as to why the AF did come out with the “officially recognized” (my emphasis) but unofficial ceremony was to eliminate or otherwise minimize the ridiculous number of differing ceremonies and scripts being performed or read both on bases and in the local civilian communities. Some of these ceremonies were written and directed with the drama of a Shakespearan play. A person should pay attention to what is APPROPRIATE to Honor the Flag, not to what would be the most impressive thing that could be done. Since I left the Base Honor Guard at Holloman AFB and retired from the Air Force, I have seen several articles or comments mentioning the flag-fold ceremony being used for Military Funeral Honors. This bothers me for a few reasons, the very first being that a Military Funeral or Memorial Service is no place for such a thing! Each Military Service does have its own official protocols and procedures for honoring its veterans during Military Funeral Honors. If the family or veteran organization wants to do a flag-fold ceremony to honor the deceased, then let them do so separately from the funeral and certainly NOT with the Flag that drapes the casket!!! You can go here: http://www.af.mil/main/contactus.asp to initiate a query. Somebody from the Pentagon Air Force Public Affairs directorate will read your query. They should respond quickly to that. I don’t know if they’ll give it to you or not. It’s certainly not classified or anything. You can offer to send a blank tape, as they may site cost as a reason they can’t do it. If they still say no, then you might mention the Freedom of Information Act, “FOIA”. That sets off alarm bells, becasue it involves a lot of paper work. However, if they process a FOIA request, you may be responcible for paying all costs involved. They could calculate in the cost of a blank tape and manhours. Or you could locate your closest Air Force Base, go to their web site, get the base operator number, request the Public Affairs office number, and ask for community relations. Then, if you mention your interest in showing the video to school groups and Boy Scouts, they may ask their local protocol office (usually less than a three minute walk from the Public Affairs staff) to provide a copy of the tape. Todd, thanks for the further correction. Todd — the video your story mentioned. Was it ever distributed? Would it be appropriate for Scout or school groups? Is it available to the public? Thanks, Ed. But I can’t take credit for writing the ceremony itself, just the Air Force News story that promoted it. The people in Air Force Services wrote the flag script. The script was approved by the four-star generals that attended “Corona Top” at McDill Air Force Base, Florida in July 2005. The script was initially performed by the McDill AFB Honor Guard for those generals. Thanks for dropping by, Todd — great explanation, too. I hope people will read your explanation. And, by the way, the ceremony you wrote is very nice. Clean, concise, historically accurate — I hope it gets used a lot. Did you see the story a Las Vegas newspaper did on flag folding and the ceremony you wrote? The Las Vegas Review-Journal did a story on July 4 of last year; I blogged about it here. I especially liked the photos, taken from the roof of the hangar. You asked about the Flag folding ceremony going around the internet. I think this site might be the one you meant. Thank you for calling to my attention the Bolling AFB site’s update. There are other government sites that have informed me they cannot update without a link to something like that site — now they can get up to date, too. Linda, the website you mentioned somehow didn’t come through. Could you repost the link? I am an author of a soon-to-be-published book. I have looked into the authenticity of the Flag Folding ceremony and have found information similar to yours. You may want to search the Code of Federal Regulations (CFR), also at the Findlaw site. There may be something there, but I haven’t found it yet. If you find it, please let me know.